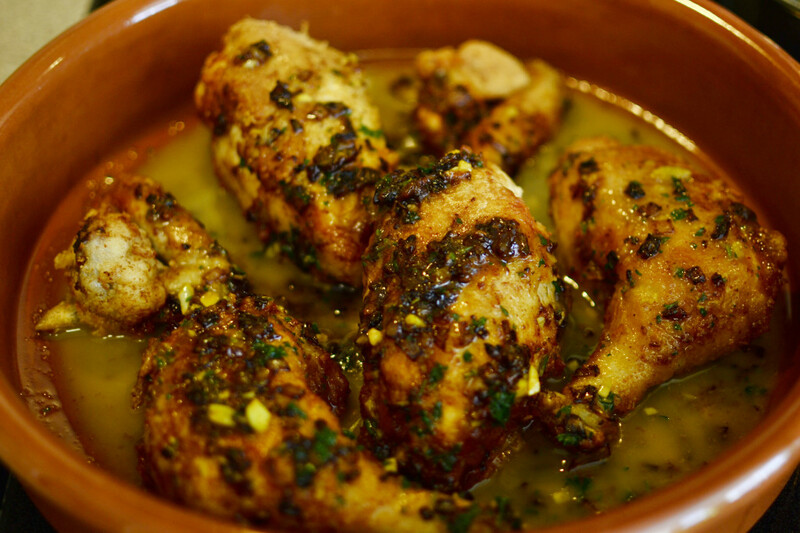 A remarkably tender chicken roasted in a saffron wine sauce. A Spanish wonder. Reserve 1 tablespoon of the flour. Season the chicken pieces with salt and coat them with the remaining flour. Heat the oil with the butter in a skillet. Add the pieces of chicken and cook over medium heat until browned. Transfer to an ovenproof casserole. Add the onion to the skillet and cook over low heat, stirring occasionally for about 10 minutes. While the onion is cooking, crush the garlic, parsley and saffron in a mortar and mix in the wine. Stir the reserved flour into the onions and stir continuously for 2 minutes. Add in the wine mixture and bring to a boil, stirring continuously, then pour over the chicken. Put the casserole in the oven and cook for 35 to 45 minutes until chicken is cooked through and tender.